This entry was posted in Blog, Ducks and tagged ducks, eagles, farm losses, hawks, NaBloPoMo, owls, predation, predators, raccoons. Bookmark the permalink. Oh that is sad yet hard to prevent, unless as you say, you clip their wings or keep them caged up. We kept fancy pigeons on the farm which unfortunately were a favorite of hawks and eagles. It’s heart breaking, especially when one becomes attached, like we did and like you are, to your animals. Still I’d rather give them the freedom than keep them restricted. When I kept a large and diverse bunch of poultry (chickens, ducks, geese) free-range, this was a problem. It’s hard to avoid. I wasn’t consistent with wing clippings for the very reasons you mention. Right now, all I have is a tiny flock of chickens. I keep them in an enclosure around their coop, but it’s a large one. I don’t clip their wings and they will go in and out of the enclosure. So they are semi-free range. It’s a home flock, though, just for eggs for the family. A few of my friends think I should let them roam completely free. I work off my farm and my older kids at home (who help) work and go to school. It’s safer for our hens to have this arrangement. If I were to expand the farm and have larger flocks again, I’d probably do what you do. Sounds like you’ve worked out a good compromise… If I never had to leave the farm and if I spent every minute outside, obviously everyone would be safer. But it’s just not realistic to be on guard every minute… It winds up being a bit of a juggling act, trying to find the right balance between safety and freedom. Sorry to hear and see what happened. I’m sure you’ll come up with a good solution you and the ducks will like. Perhaps it was a rare one of a kind event. Abundance is the ability to celebrate many occasions. In the Healing Garden plants are displayed for residents who range freely in public housing. Not all tenants and employees are domesticated. Healing our hearts is difficult when life takes a piece. When the Garden was installed, some gardeners said some plants were too nice for ‘this kind of garden.’ My inner response to these comments convinced me that our Healing Gardens need the most beautiful, unusual, rare and fragile plants too. Healing requires cautious abundance. We need to heal because we are vulnerable. Myths and stories abound with mystical inventions for avoiding poverty, death, loss, old age, fear and pain. By definition, we can not experience periods of wealth, life, gain, youth, freedom and pleasure without the capacity to be vulnerable. While sad, it is all in the realm of nature. You lost a duck, but the creature who ate it gained a few more days from the food. True enough… Though, I’d be happier if the hungry one had snacked on a rat or a rabbit rather than one of my ducks! Now and again I have had trouble with airborne predators. Hawks by day and owls by night. I keep my birds penned at night to protect them from the owls, and the night stalking four legged critters. However, I don’t keep them locked up during the day unless I am going to be away for hours. The way I see it, is: “Hawks gotta eat.” It sounds harsh, but they don’t come around often, and for me, here at least, they are few and far between. There once was a hawk that stuck around for awhile, so I then penned everyone up for a month and he moved on. That was over two years ago. It is a tough call, but we seem to have found a balance here. It sounds like you’ve figured out a pretty good system there… And, yes – I know the hunters have to eat, too. 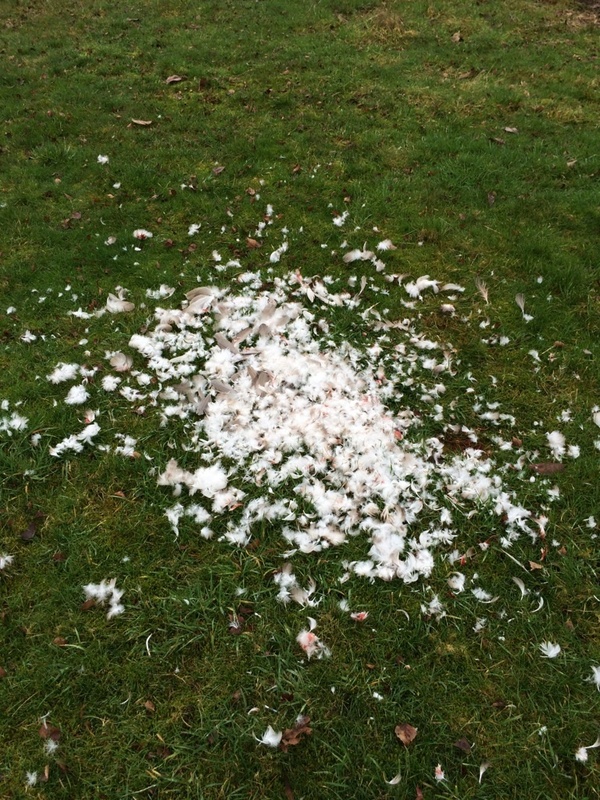 I love birds of prey, but it still is a horrible feeling to come across a pile of feathers. Yuck! I once broke up a rather grizzly party the ravens were having over at the neighbour’s place after the arrival of some new chicks… Not a pretty picture. Worst of all is the way ravens mock you as they fly off, chortling.